The adaptation of S.E. Hinton's youth-in-peril novel, The Outsiders is a sombre affair. Francis Ford Coppola finds the drama amongst the scrappy youth caught between childhood and adulthood, but cannot locate the soul of their anguish. It's 1965 in Tulsa, Oklahoma, and the Greasers are a gang of tough kids from broken homes on the wrong side of the tracks. Ponyboy (C. Thomas Howell) is quiet and sensitive but still a Greaser, while his eldest brother Darrel (Patrick Swayze) is violent and struggling to cope with head-of-the-family responsibilities now that their parents are dead. Middle brother Sodapop (Rob Lowe) is often caught between Ponyboy and Darrel. Ponyboy's best friend is the knife-wielding, baby-faced Johnny (Ralph Macchio), and the other Greasers include Two Bit (Emilio Estevez), Steve (Tom Cruise) and Tim (Glenn Withrow). The unofficial leader of the Greasers is Dallas (Matt Dillon), who has only recently been released from jail. 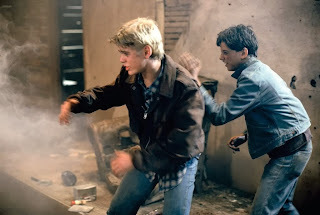 While walking home, Ponyboy is attacked by members of the Socs, a rival gang of wealthier kids. Later, after Ponyboy and Johnny spend some time with middle-class girls Cherry (Diane Lane) and Marcia (Michelle Meyrink), the Socs show up to settle scores. With Ponyboy outnumbered and almost being drowned by the Socs, Johnny springs into action and uses his knife to kill one Soc and scare away the others. Dallas helps Ponyboy and Johnny to escape and hide-out in an abandoned church. But the Socs want revenge in the form of an all-out brawl between the gangs, while Ponyboy, Dallas and Johnny encounter an unexpected opportunity for heroism that takes a tragic turn. Coppola assembled what proved to be quite the spectacular cast of young talent for The Outsiders. Rarely has a film brought together so many young actors who would go on to have long and successful careers. Ironically, Howell and Macchio, the two most prominent Greasers, would eventually have relatively lower profile adult success compared to Cruise, Swayze, Dillon, Lowe, Estevez and Lane. The talent on display enhances The Outsiders, as even small roles like Two Bit, Sodapop and Cherry are well worth watching. In terms of the drama, The Outsiders recounts a sad story but without finding a spark to elevate it onto any sort of emotional plain. The Greasers are deserving of empathy, kids cast adrift with not a capable parent in sight, but not enough is ever revealed about them to make them anything other than kids who are likely to get into trouble. There are some touching and quiet moments as Ponyboy and Johnny hide out in an isolated church for several days, reading Gone With The Wind and sharing their innermost thoughts, but the serenity is delivered at some cost in plausibility: street-tough 14 year old kids suddenly behaving like rational adults requires quite the mental leap. And the film cannot do much to overcome the weaknesses and derivatives in the original narrative. There are some strong whiffs of Romeo And Juliet without the romance and West Side Story without the music, while the brawl appears to mostly serve as an artificial kinetic jolt to enliven an otherwise downbeat final 60 minutes. The 2005 "Complete Novel" re-release, a director's cut by another name, reinserts deleted scenes and adds 22 minutes to the running time. 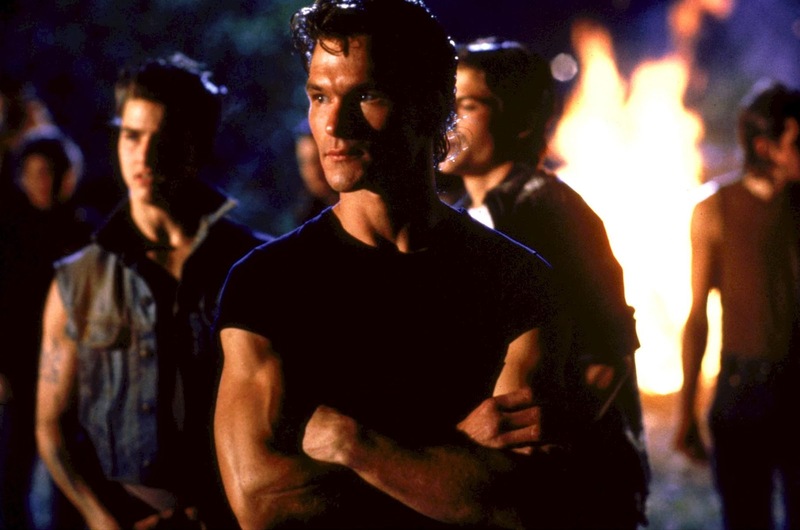 Most of the additions occur at the front end to better establish Ponyboy, the Greasers, and the context of the gang rivalry, creating a more cohesive experience. However, the complete abandonment of Carmine Coppola's evocative orchestral score, replaced by contemporary high-tempo mid-1960s hits, is a change with debatable merits. The Outsiders has talent behind and in front of the camera that surpasses the material. The Greasers are worth a look, but the experience is not all that slick.